Vanilla ice cream is the most popular ice cream in the world. Try my custard base recipe for one of the best flavors ever. As all my readers know, ice cream is not just a hobby for me, it's a passion. 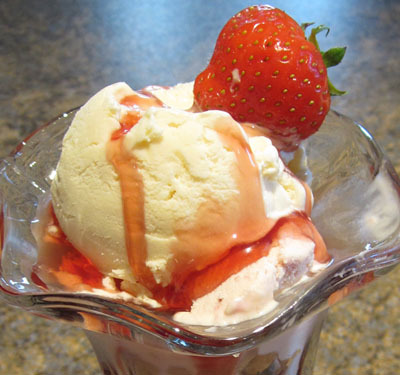 Going beyond just making ice cream and creating sundaes I like to delve into lots of other interesting areas such as the history of ice cream, ice cream sculpting and how this wonderful food is a part of our lives. I even have pages on ice cream and movie stars and US Presidents! You can find them and more in my Special Features section. I find it natural to want to know what interests my readers so I study the traffic to my website, blog and social media pages. In the last few years the site has enjoyed over 2 million visitors per annum with the highest single day's traffic at 92,279 visitors in 24 hours. 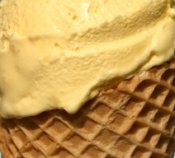 All my site's visitors are looking for free and easy-to-follow information on ice cream making - something I have worked for more than 10 years to deliver. The enthusiastic feedback I get makes it all worthwhile. If in a single year you get around 7 million page views with 228,039 keyword variations used to find a website, as has happened with this site, there is much that can gleaned about the most popular flavors for recipe hunters. No doubt this pattern will change as people's tastes change, perhaps becoming more adventurous or following new food fashion trends; also as more people from more countries around the world use the Internet to search for recipe ideas. That's the one thing about ice cream - it's popularity is here to stay. It is truly an 'evergreen' food and for good reason! Apart from the huge variety of taste, color and texture that ice cream affords, it is also a fabulous FUN food. Long may that be the case. If you are looking for more adventurous ice cream ideas try my list of unusual recipes where there's something for everyone. Blueberry ice cream is on the list which is a custard base recipe of mine using a real vanilla pod. It's now a firm favorite in my family! On the list you will also find ideas for alcoholic ice cream including sorbets made with wine - ideal for dinner parties or special celebrations. If it's seriously unusual ice cream you're interested in, then that's made in Japan - read about Japanese Ice Cream here. From goat ice cream to cactus flavor and even viagra ice cream it's all there if you want it. Somebody must like them or they wouldn't be made on a commercial scale but,even so, I dout they will ever graduate to the top 10 list of most popular ice creams in the world.